When unforeseen circumstances creates a situation where power is lost to our primary Fairfield location we have a procedure in place to ensure business continuity. Please follow these procedures and direct any issues to SmolinIT165@gmail.com. Emergency access will strictly be limited to RDS access. 1. From home go to a Smolin or personal computer. 2. 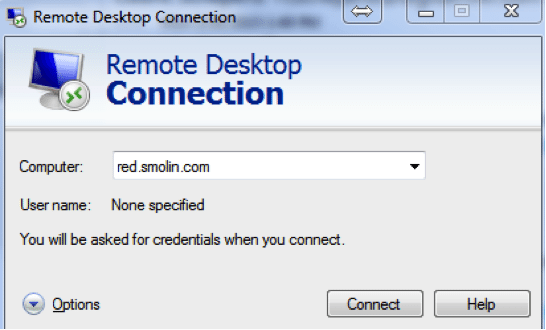 Click Start>All Programs>Accessories> then choose Remote Desktop Connection. 4. When asked for credentials enter your normal windows username and password.